Vtiger is a strong Customer Relationship Management (CRM). 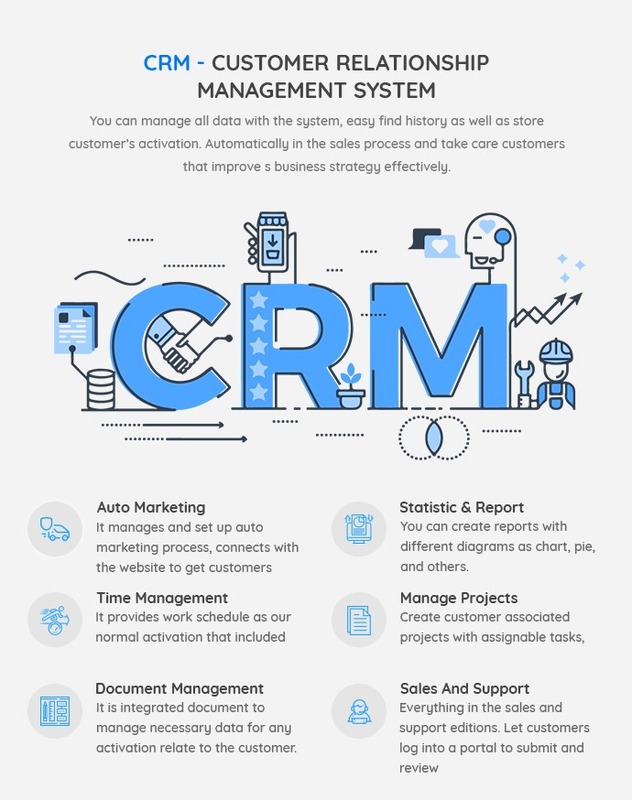 With Vtiger CRM, all important data such as sales orders, customer information, product, after-sales service are protected and managed very well. We are realized that if your Magento site is integrated Vtiger, it will be the perfect site. 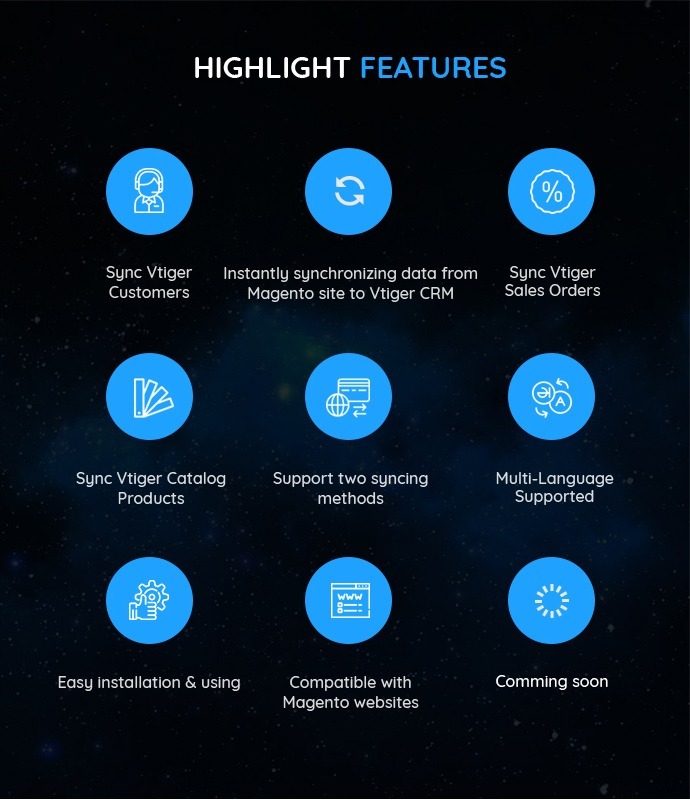 By installing "Synchronize Database Magento With Vtiger CRM Extension", all information related to your sales will be synchronized and updated automatically from Magento website to Vtiger CRM system. Therefore, you will keep in touch with your customers and take care them carefully to increase sale revenue. You can manage all data with the system, easy find history as well as store customer’s activation. Automatically in the sales process and take care customers that improve s business strategy effectively. Auto Marketing: It manages and set up auto marketing process, connects with the website to get customers database. Time Management: It provides work schedule as our normal activation that included meeting, event to-do list. Statistic & Report: You can create reports with different diagrams as chart, pie, and others. Manage Projects: Create customer associated projects with assignable tasks, and due date. Document Management: It is integrated document to manage necessary data for any activation relate to the customer. + Synchronize quickly data as Customer, Products, and Sale Order from Magento Site to Vtiger CRM and vice versa. + Help your business understands more customers. + Improve products as customer expectation. + Easy to install and use. 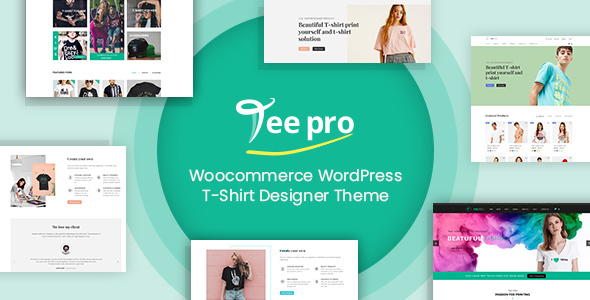 + Make your website become more professional. + Increase sales and revenue. 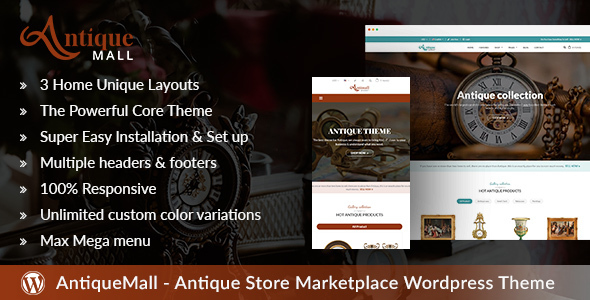 + Be approached more products through email marketing strategy of the shop owner. + Buy products that are suitable with their expectation. Step 2: Install Module: In Magento admin, you go to System→ Magento Connect → Magento Connect Manager -> upload the install package and install as usual. Step 3. Getting Vtiger Access Information: To get Vtiger Account Information in step 4: first of all, open your Vtiger CRM's database connectivity file i.e; config.inc.php file in root directory of CRM and find the arrow directed fields in your config.inc.php file as CRM Site Url, CRM Root Path, Database Hostname, Database Username, Database Password, Database Name. Then, to get Access Key, go to your Vtiger account and click on your profile name in the top right corner, then go to My Preferences. Scroll to the bottom of the page, you can see the Access Key in User Advanced Options and copy the value in the appropriate field on Vtiger. Finally, Username is user name when you login Vtiger CRM site. Step 4. Configure in backend: In Magento admin, you go to Vtigersyncing -> Vtiger Connectivity. You paste information that gets from step 3. Remembering to save Configure. Step 5. Synchronize data (product, customer, sale order): There are two ways to synchronize data: auto syncing and manually syncing. To synchronizing data by "auto syncing', you go to Vtigersyncing -> click on "Auto Syncing" and you can synchronize data automatically here. Or if you want to synchronize data by "manual syncing", you go to Vtigersyncing -> click on "Manual Syncing" and you can synchronize selected data here. Step 6. View result of synchronizing: To view synchronizing results, you access to the corresponding data management of each site. 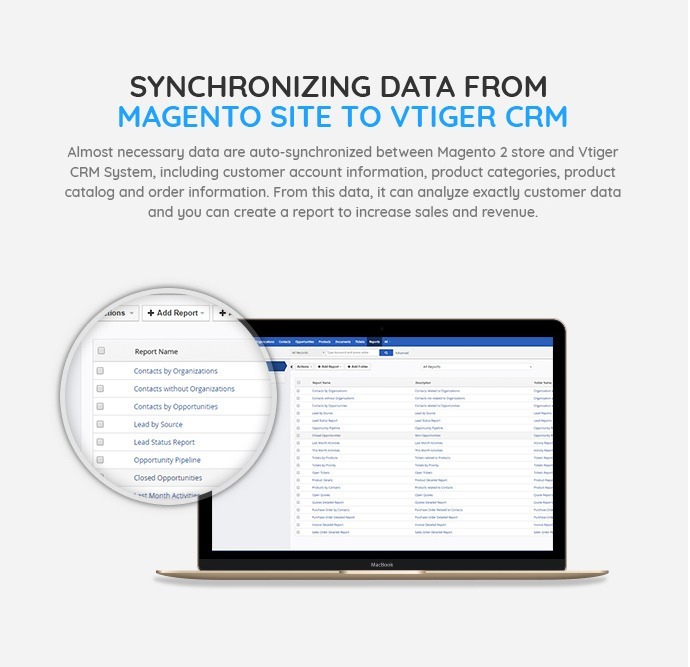 Instantly synchronizing data from Magento site to Vtiger CRM: Almost necessary data are auto-synchronized between Magento store and Vtiger CRM System, including customer account information, product categories, product catalog and order information. From this data, it can analyze exactly customer data and you can create a report to increase sales and revenue. 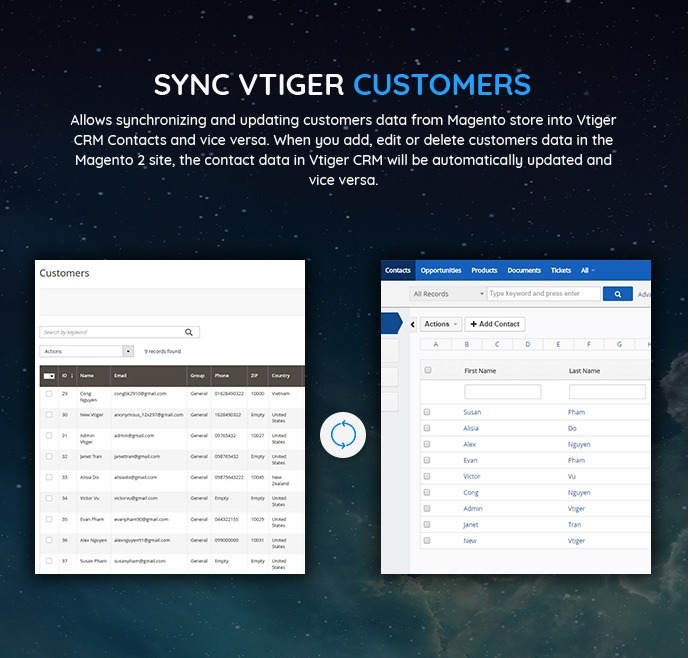 Sync Vtiger Customers: Allows synchronizing and updating customer data from Magento store into Vtiger CRM Contacts and vice versa. 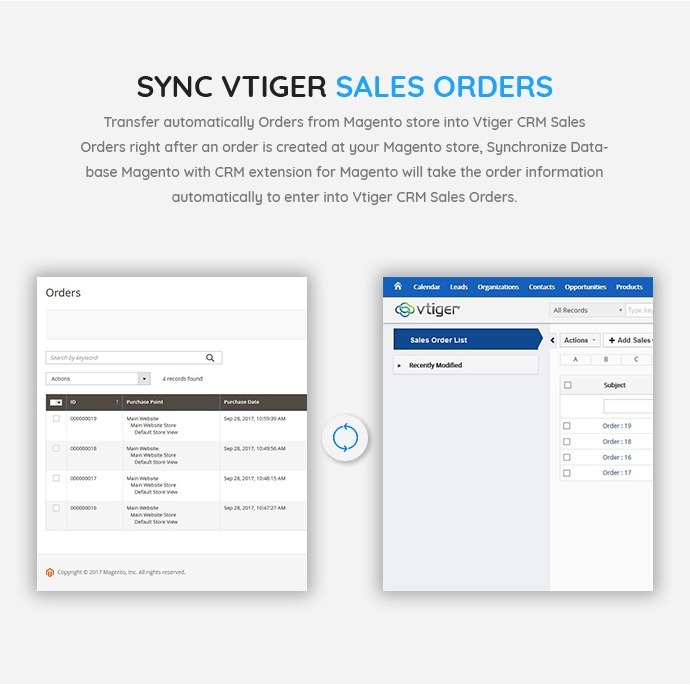 Sync Vtiger Sales Orders: Transfer automatically Orders from Magento store into Vtiger CRM Sales Orders right after an order is created at your Magento store, Magento Vtiger CRM Sync module will take the order information automatically to enter into Vtiger CRM Sales Orders. 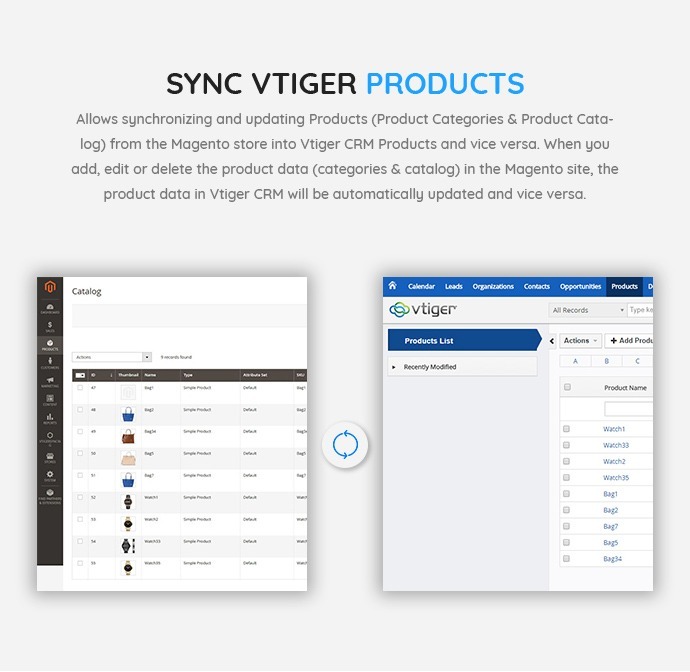 Sync Vtiger Products: Allows synchronizing and updating Products (Product Categories & Product Catalog) from Magento store into Vtiger CRM Products and vice versa. 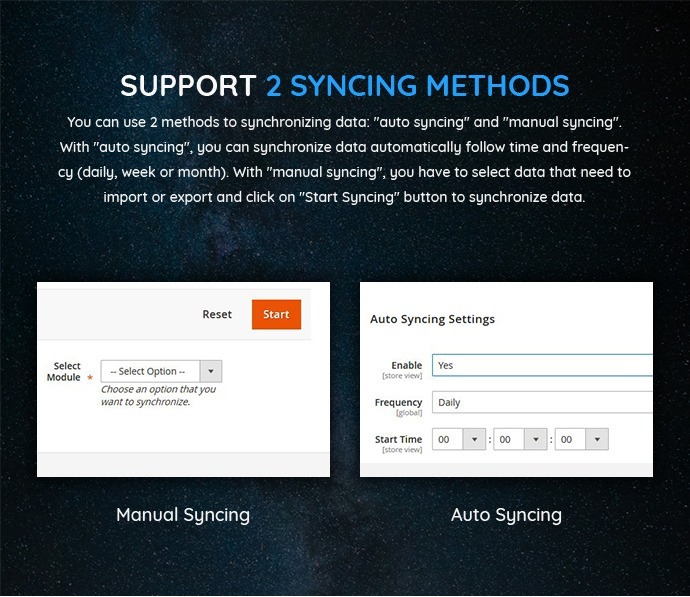 Support 2 syncing methods: You can use 2 methods to synchronizing data: "auto syncing" and "manual syncing". With "auto syncing", you can synchronize data automatically follow time and frequency (daily, week or month). With "manual syncing", you have to select data that need to import or export and click on "Start Syncing" button to synchronize data. Multi-Language Supported: This extension will help customers all over the world understand website easier with their own languages. 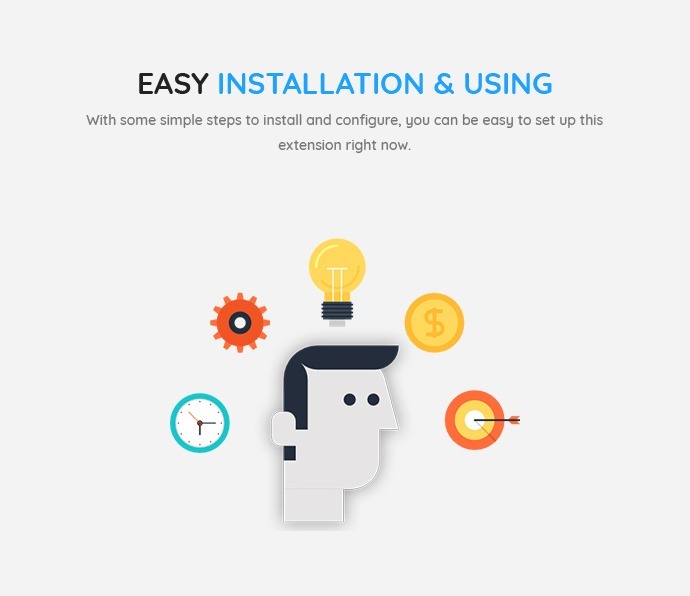 Easy installation & using: With some simple steps to install and configure, you can be easy to set up this extension right now. 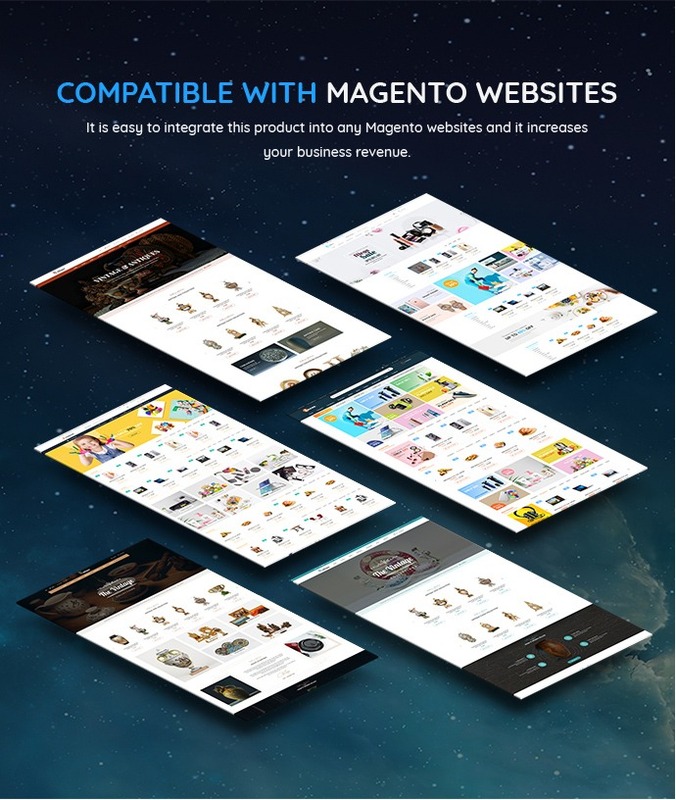 Compatible with Magento websites: It is easy to integrate this product into any Magento websites and it increases your business revenue. I have been using Vtiger CRM for my web store and your ext is what I need to synchronize database. Good. I've been running it for 2 weeks, I just can conclude that your extension runs smoothly and amazing. Your support is also great so I hardly cope with any problems when installing. Which information is automatically synchronized between Magento Store and Vtiger CRM? 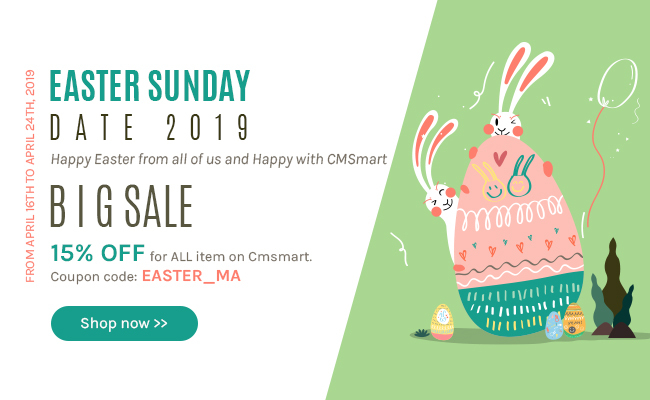 All necessary data such as customer account information, product categories, product catalog and order information is automatically synchronized between Magento Store and Vtiger CRM System. 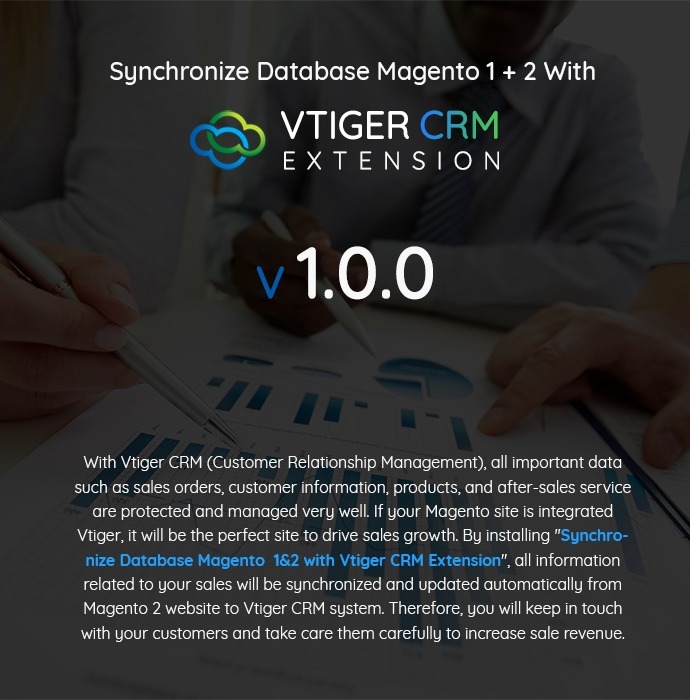 Is Synchronize Database Magento 1 & 2 With Vtiger CRM Extension compatible with Magento versions? Yes. It is. It is easy to integrate this into any Magento versions. Yes, it does. This extension can support all kinds of languages. However, you need to translate it into your wished languages by yourself. Our Dev team will support and guide you how to make it. How many methods can I use to synchronize data? For Auto Syncing, can I import or export data with a click? Yes, you can. You just need to select data that need to import or export, then click on “Start Syncing” button to synchronize data. Is this Synchronize Database Magento 1 & 2 With Vtiger CRM Extension used for both Magento 1 and Magento 2? Yes, it is. There are 2 packages in this extension: one for magento 1, another for magento 2. You can choose the package suitable with your Magento. I did the payment, why haven’t I received the download link? -Auto Renewal Payment: with this package, you 12 months to receive our support, download and upgrade FREE. But, after 12 months, you only pay a small recurring fee for each 12 months, you DON'T need to buy the product again. Does this module syncronize both ways? If I were to create a new sales order in vTiger with this module, would that order also show up in the Magento 2 back-office? And is it possible to host vTiger and Mangeto on two seperate domains? How are you today? I am Janet here, it is my pleasure to support you in this case. Yes, of course. It is possible to host vTiger and Magento on two separate domains. And if you were to create a new sales order in vTiger with this module, that order would show up in the Magento 2 back-office. So you do not worry about that. Feel free to contact me with the information below if you have any question to get the quick response. I am available to support you. Does it works with vTiger 7 Open Source? Thanks a lot for your interest in our products. I am Janet, it is my pleasure to support you in this case. Yes, absolutely. Our extension works with VTiger 7 Open Source. So you do not worry about that. Do you have other questions? Feel free to contact me with the information below to get the quick response.